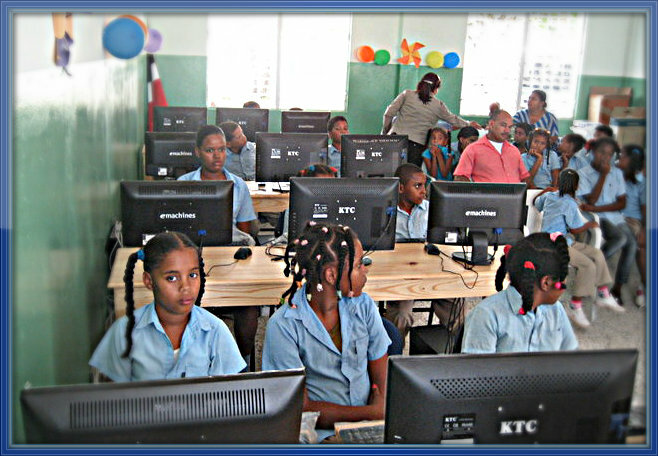 The Rotary clubs of Deerfield, Lincolnshire Morning Star, Long Grove and Wheeling of District 6440, with the Rotary Club of Westerwald in the German District 1810 and the Club Rotario Pimentel, Duarte in the Dominican Republic in District 6040, are proud to announce the Inauguration of two new computer labs in the elementary schools in the Dominican Republic. Both labs opened with special ceremonies on June 15, 2012. This project was funded through contributions by the participating clubs and a matching humanitarian grant from The Rotary Foundation. "This project is an excellent example of several clubs and districts partnering to have greater impact, and is the model that will be encouraged as The Rotary Foundation implements Future Vision," said District Governor Carlos Frum. "Our clubs are to be congratulated on organizing a fine project that will improve educational opportunities for so many students." The computer labs are equipped not only with the obvious computers but with printers, power inverters, battery backup, DataShow system, screen, ceiling fans, and security for the doors and windows. The computer labs are for instructional and educational programs only and do not have access to the internet. Usage, administration and maintenance is coordinated by a committee integrated by local Rotarians, teachers, school staff and members of the community. The inauguration events were attended by students, school teachers, Rotarians from the Pimentel Rotary Club, government leaders and members of the respective communities. The Club Rotario Pimentel, Duarte sends their deepest appreciation to all contributors and asked that we share the attached photos for your reference. More photos detailing the process and the inauguration at both sites are available through the http://www.lincolnshirerotary.org/ + Photo Albums + Dominican Republic Computer Labs.